Before we talked about a customizable personal Internet Radio service called Pandora. This time we’re going to look at a service that is at least twice as groovy, heck it even has “groove” in the name! Not only is it groovy but I feel it’s also the most complete, 100% customizable Internet radio. It’s called Grooveshark. 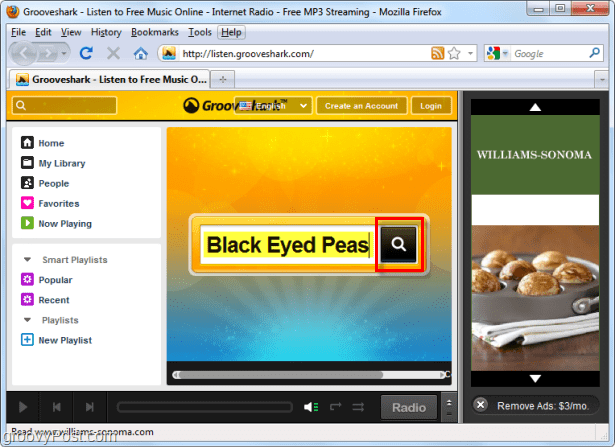 The first thing to notice is that Grooveshark requires no registration. Of course optionally creating an account will enable many groovy features, so we’ll look at those further down in this article. 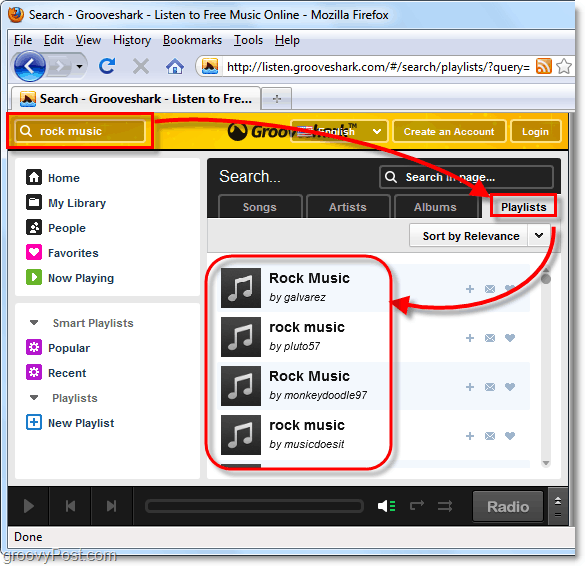 Note that Grooveshark is a web app and requires a constant Internet connection to function. 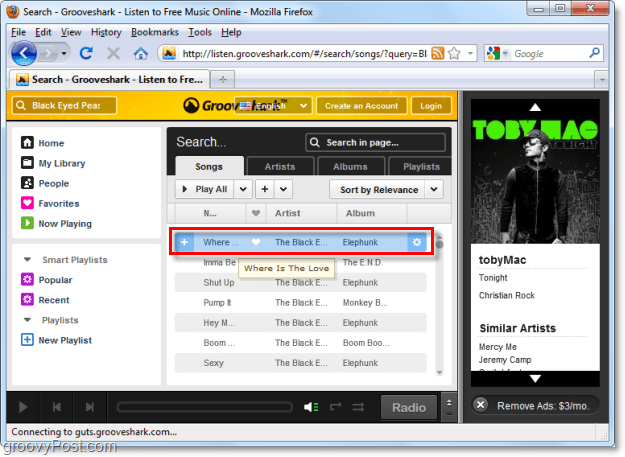 Grooveshark is very simple to use, just Type in the song or artist that you want to hear and Press Search. 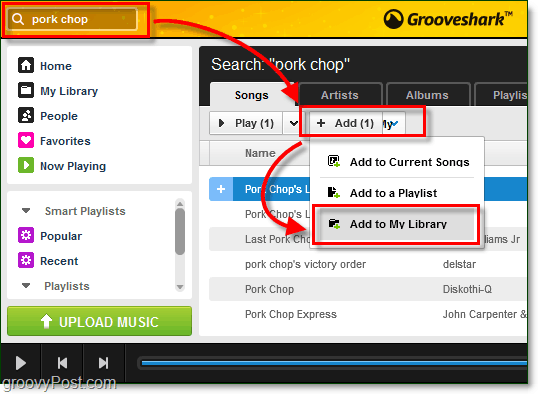 Grooveshark has a vast music library, and you should be able to find ANY song you want. Wow, groovy baby yeah! Unlike Pandora, Grooveshark will let you play any song by any artist whenever you want. No waiting for a recommendation engine to randomly pump out your favorites, it’s all on-demand. Plus, if you want to start a song over, you can! That’s something that’s always bothered me about Pandora. When you’ve searched out some songs or found a playlist you like, you can use the Play All button to add every song to your “Current Songs” list and hear all of them in order. 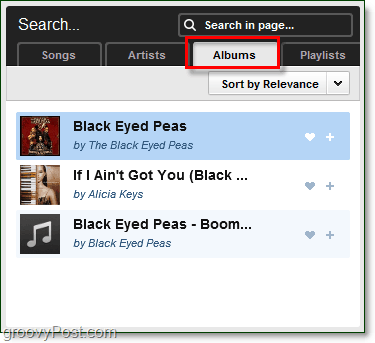 Another groovy feature is Playlist search. The way the feature was integrated wasn’t entirely thought out but, if you want to find a particular type of music just Search for it (e.g. “rock music”) and then Click the Playlists tab. 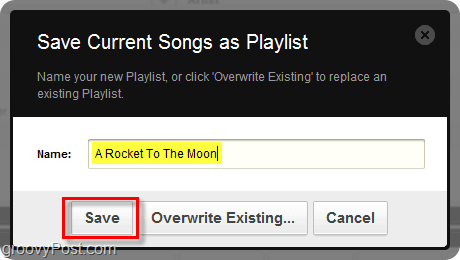 Displayed will be a list of playlists made by different Grooveshark users, usually related to your search. Once you click a user’s playlist, it will take you right to their playlist page. Here you can view and add all of the songs on their playlist, or just the ones you like. 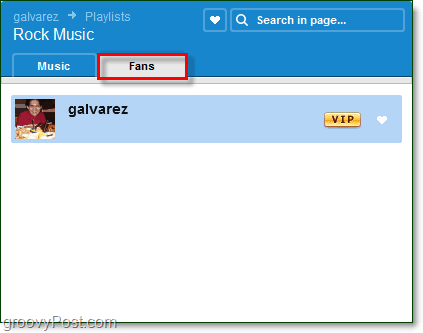 If you Click the Fans tab, it will show you how many people like the users playlist enough to become fans. Usually, this is an accurate indicator of how good someone’s Playlist is. Sorry galvarez looks like your only fan is yourself. 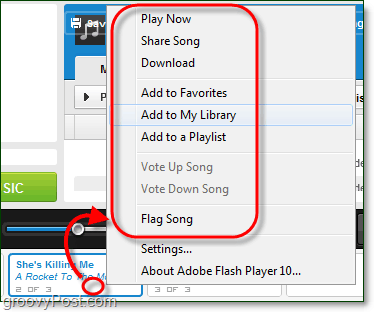 Another way to find songs that might be worth listening to is to use the Popular Music Smart Playlist. 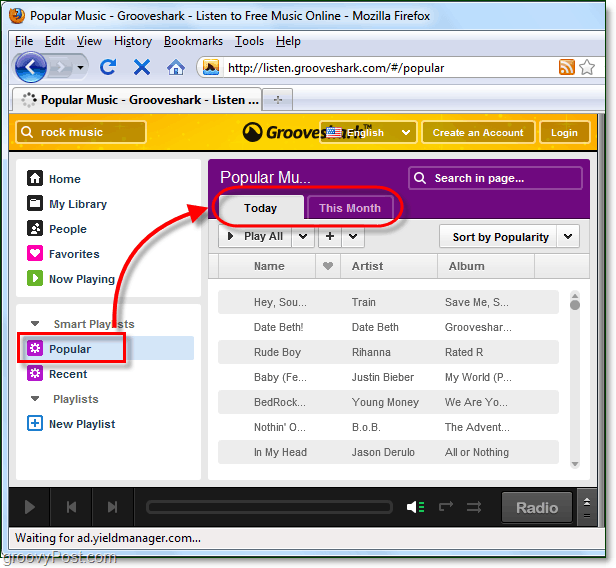 This playlist will show you which music Grooveshark users are listening to the most. You can sort this list by Today’s top songs, or this Month’s top songs. 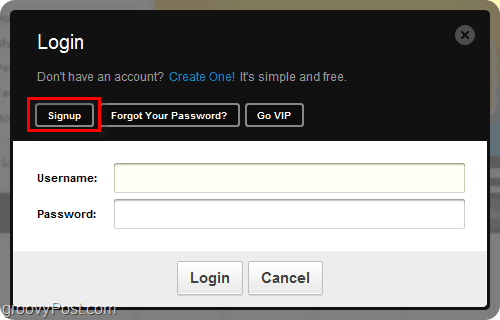 Grooveshark has two types of registration options, free and the paid “V.I.P.” account. Free accounts add a lot of features and save options that are worth the trouble and the V.I.P. accounts have a bunch of very groovy features such as ad-removal. To register is easy; just Click the Create Account button or Click on any of the registered features within Grooveshark to be taken to the registration window. 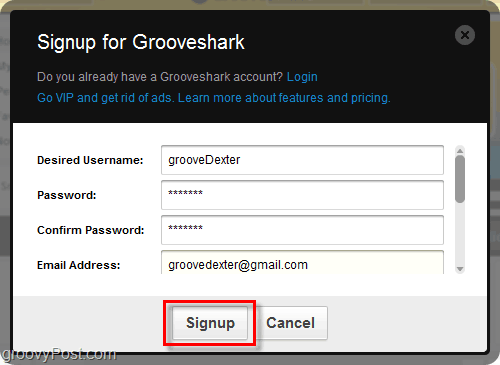 Signup for Grooveshark is quick, just fill in a few details using real, or fake information. There is no email verification required so you can jump right in once you Click Signup. Now that you’ve registered an account, you can Save songs to Playlists or your music Library. Neither are interconnected, so playlist songs do not get automatically added to your Library; you’ll have to add them separately. Saving Playlists allows you to create fully customizable soundtracks where you can choose the name. If you incorrectly name a Playlist, you can always just Click Save again and Overwrite the old one. Once you save your Playlist, it will show up under your Playlists menu on the left sidebar. 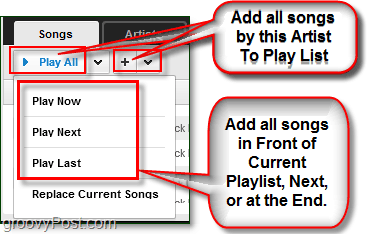 You can quickly access and reload the songs from your list at any time from here. It was a little confusing at first figuring out how to add songs to my music library in Grooveshark. After a little bit of poking around, I discovered there are several different ways to do it, some more subtle than others. 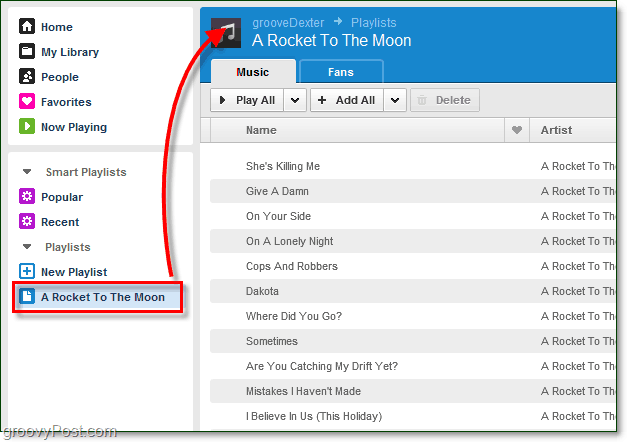 One way to add songs to your music library in Grooveshark is to Right-Click a song from your current song list and Select Add to My Library. 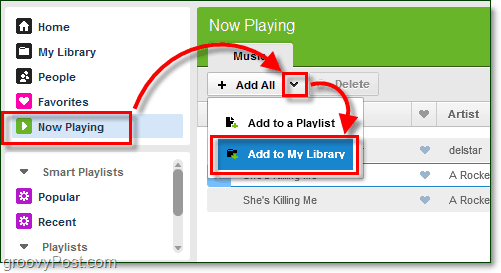 Another way to add songs to your music library is to Search for music and then use the + Add button to save them. And at last, my favorite way to add music is to use the Now Playing list to + Add All current songs to my music library. If you just flat out can’t think of any music or playlist search terms to listen to, then it is time to Click the Radio button. 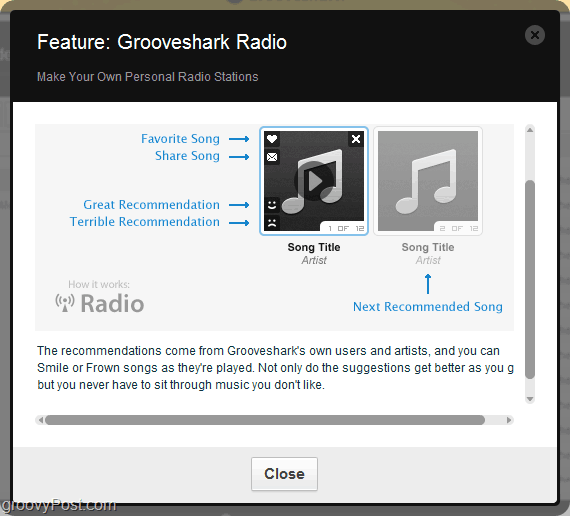 Grooveshark radio is similar to the web app Pandora. It takes what music you already listen to and attempts to automatically find and present new music that has similar musical qualities. Instead of Thumbs Up/Down Grooveshark has Happy Smiley or Sad Smiley you can click to rate each song. Note that Grooveshark radio won’t work unless you have added a lot of music to your Library. 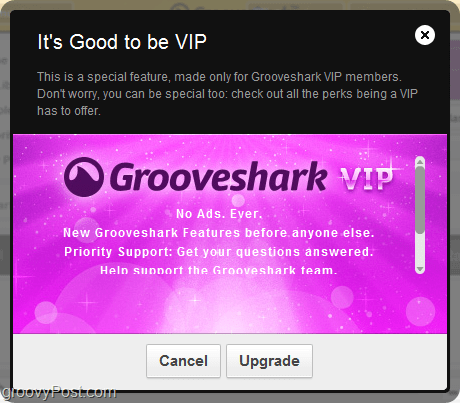 A Grooveshark VIP account will cost you $3 per month, or $30 per year. You get two months free by paying a full year in advance. The features range from useless to extraordinary. Here is the list so you can judge for yourself if paying is worth it. Access to the Grooveshark Desktop Client, runs faster and more efficiently than the web app, also displays little notifications to let you know what is playing when a new song starts. Get Grooveshark Mobile for free. Unfortunately, this only works on jailbroken iPhones since Apple won’t allow Grooveshark into their App Store. Use Last.fm to monitor your music listening habits. 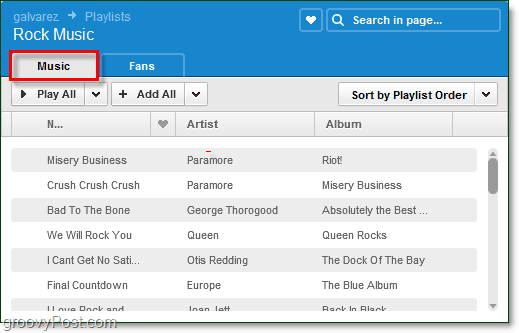 Nearly unlimited favorites, VIPs get 5000 Favorite songs and 50000 songs in your Library to keep all the best organized. Customized Grooveshark screen resolution, mostly for people using 30+ inch monitors. Fun Themed Client, adds backgrounds and other visual effects to Grooveshark. Instant access to “Beta” features that haven’t released on the main site yet. See the full VIP information page and Signup here. That just about fully covers Grooveshark. It’s a groovin’ web app, and if it only had an “official” iPhone app, I would probably be listening to it 24/7. If you have a groovy question, noticed something we missed, or just want to talk about Grooveshark, drop a comment below! Also check out the groovyPost RSS feed for daily groovy computer-related news, how-to, and reviews. This service is my music weapon of choice. The interface is much better than Pandora and I’m a sucker for slick graphic interfaces. For me, it’s all about being able to take control when listening to a song. Sometimes I like to stop, rewind or replay a good song. Can’t do that with Pandora…. And, as opposed to Pandora & Spotify, it works without VPN-tricks in the EU countries – at least the Nordic ones. @MikBed – Good to know. Thanks for the feedback! i still do not understand wen u create an account wiv grooveshark is it free or not????? It’s not for free, it costs $ 10 per month, that’s too expensive, ill stick with Pandora. i need 2 no b4 2nite!! !